If you have been following my blog, you are aware that one book project, “The Power of Story” is nearly finished, and I’ll soon be turning to the next writing project. Since I have been collecting stories about the kids at Atall School, a one-room school in a very isolated part of the rural South Dakota, I’m hoping that some of these stories of teaching, learning, and loving make it into the next book. As you know, these stories periodically appear in this blog, and have yet to be organized into a book proposal. The first Prairie Pedagogy, I ever wrote can be found by clicking the link below. Thank you, South Dakota Magazine. In addition, more of my posts on prairie pedagogy can found found by clicking “Prairie Pedagogy” at the bottom of joanwink.com. One of the things you will learn about Atall School students is that they are all authors–Yes. They all write and publish. I first became aware of this when Trailin was in kindergarten, and I was walking by his desk and noted that several blank pieces of paper were stapled together, and the title page said in very large letters, MY JOURNAL. 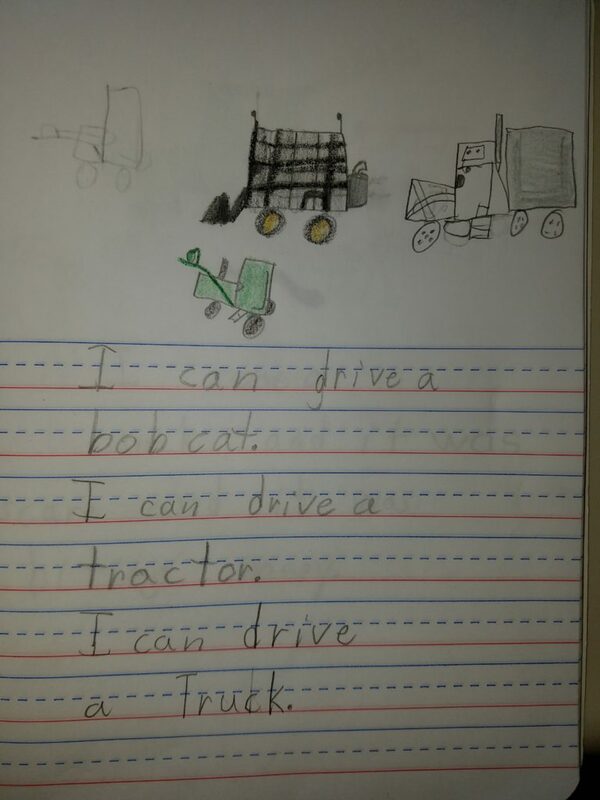 I looked at each of the pages of inventive spelling with Trailin, and it was easy to read, as he wrote so well. It became clear to me that each page was a story about a piece of equipment on his ranch. However, there was one page and one drawing, plus accompanying spelling me, which baffled me. So, I asked, “Trailin, can you please tell me about this page?” He looked at me as if I absolutely knew nothing because obviously, it was the “manure spreader” on his ranch. And, as his oral pronunciation of the letter, r, had not yet fully developed, it made me smile to hear him say it. Here is Trailin when he graduated from kindergarten. 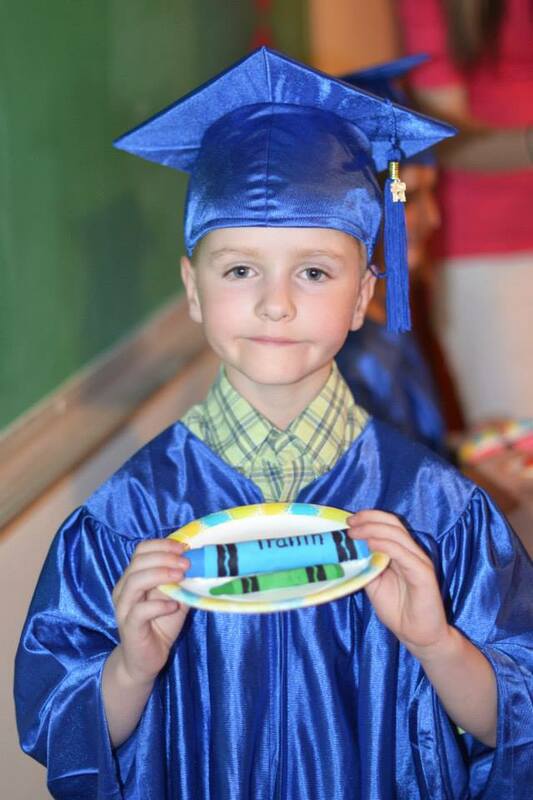 Now, flash forward to Trailin as he completed grade two. 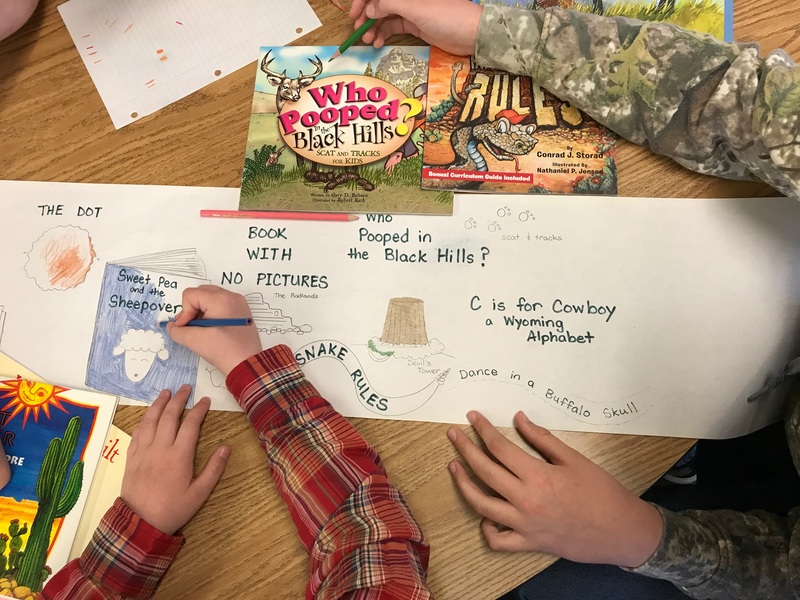 Recently, the students were in the middle of their days of mandated testing, and the teacher, Missy, wanted to have a post-test activity, which brought all of the kids together and affirmed them and their knowledge. She brought out many of the books, which we had shared with the kids during the year. Next, she asked them to decorate a banner to celebrate their memories of their learning. Missy lead the discussion and highlighted language and ideas found in the various books. The kids had been discouraged and exhausted from the testing, but they soon began to come alive again, as they talked about the various books and what they remembered. Next, each the students sat together at one table and chose a specific book to color on their school banner. 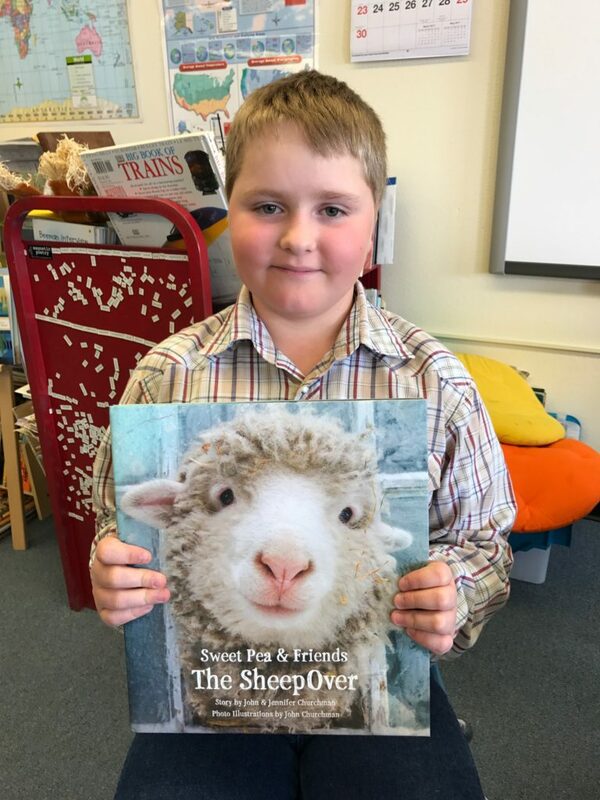 Trailin was adamant that he wanted to do the illustrations for Sweet Pea and Friends: The Sheepover, a beautiful book by John and Jennifer Churchman. I encourage you to check out their webpages. Click here. Trailin loves this book, and so do I.
Yay! And today is Trailin’s 10th birthday! He will be so excited to see this, what a birthday present. Thank you, Joan! Your influence is a big part of the success in our classroom. Your are all too wonderful! This is wonderful! Trailin will be so excited to see this, what a birthday gift – today is his 10th birthday. Thank you, Joan, you are a big key to the success in our classroom! Thank you, Missy. Yes, when I saw it was his birthday today, I knew that I had to finish it for him. Love the stories & experiences you write about the students! This made Trailin smile, and a little embarrassed as the whole world could read about him. Joan brings a big smile to all of us when she visits at school!! Your two absolutely capture my heart! 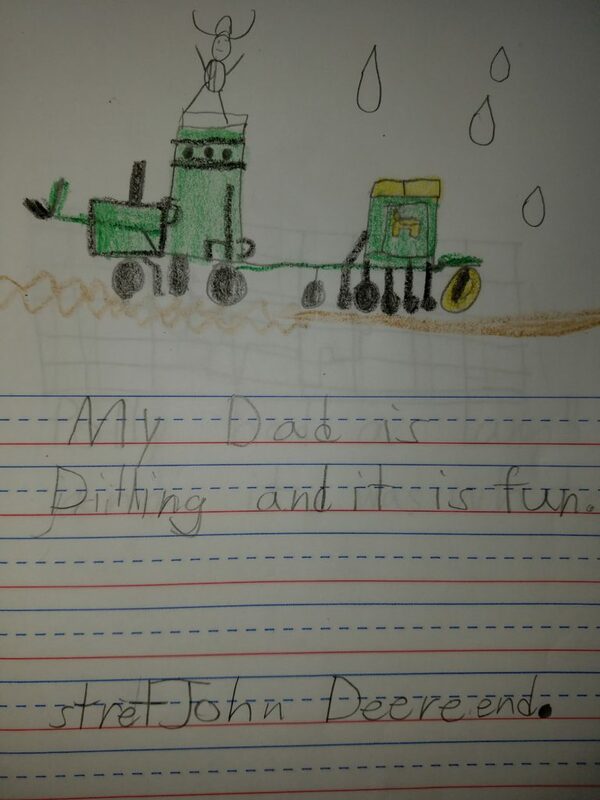 Hi Trailin, so glad you like my book,you are doing a very nice job with your illustration. Sweet Pea say hi. Thanks, John, I’ll make sure that Trailin reads your comment. Thanks.